CAREFUL: very little salt as the chicken is already marinated in salt. Cut the onions in fine strips and put them in a large saucepan. Then boil the liver and heart in a separate pan until just cooked. In a separate bowl, mix the chopped garlic and spices in ½ a liter water. Put the chicken in the mixture and rub the mixture inside and outside. Add chicken to the onions and pour a little bit of water, then mix and put on a low heat. Once boiling, add the oil, the herbs and the rest of the water. 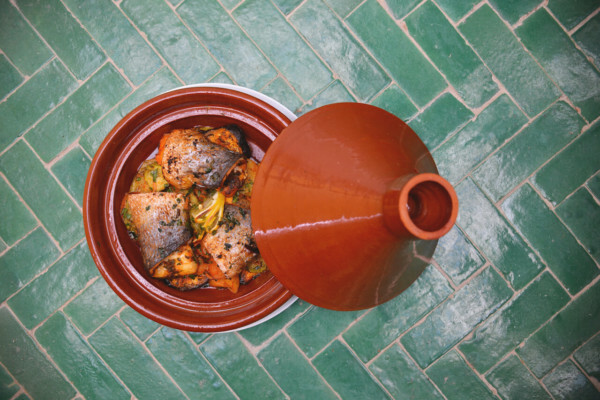 Leave to cook on a low heat, turning the chicken over at regular intervals. Once the chicken is cooked, remove from the sauce. Add the liver and heart to the sauce and leave to reduce. String regularly until the onions are completely reduced to a purée and the oil has separated. Put in a medium oven (150°C) for 30 minutes. 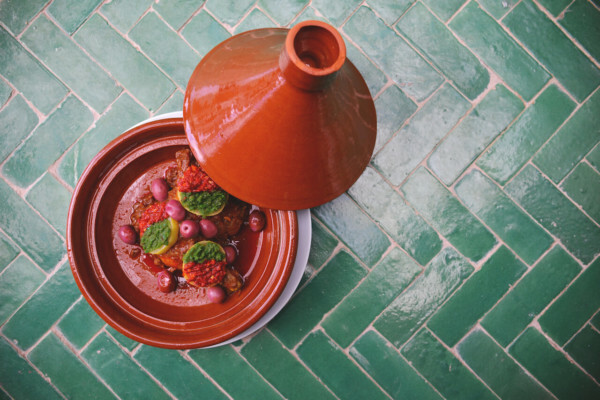 Bon appétit at Fez Cooking School!! Enjoy our recipes! Start by heating the oil in a large frying pan. Add the chicken and fry it skin-side down, until crisped up and brown. Then, turn the thighs over and cook for a couple more minutes, then remove them from the pan. Add the butter to the pan. When it has melted, add the onions and fry them gently until soft. Add spices and fry for a couple more minutes. Put the chicken back in the pan and pour in the stock or 500ml of water. After seasoning, cover the pan and simmer for about half an hour or until the chicken is tender. Remove the chicken and set it aside. When it is cool enough to handle, finely chop the meat – it’s up to you whether you keep the skin or not. Put the liquid back over the heat and reduce it by half. Finally, add the eggs to the cooking liquid and continue to cook over a low heat until you have a mixture that resembles loose scrambled eggs. Remove the pan from the heat and allow to cool. Preheat the oven to 180°C/Fan 160°C/Gas 4. To assemble the pie, you need a large ovenproof dish about 28cm in diameter. Take a sheet of filo pastry and brush it with melted butter. Drape it over the dish, making sure it is gently pushed into the corners without any tearing. Repeat with another sheet of filo, this time placing it at a right angle to the first. Repeat with a further 2 sheets of filo, this time placing them on the diagonal. Spread the filling over the pastry. Fold over the overhanging pieces of filo in reverse order – they should just about cover the filling. Take the remaining 2 pieces of filo and cut them to fit the dish. Brush them with butter, then cover the pie, tucking under any corners. Bake the pie in the oven for about 30 minutes until the pastry is a crisp, golden brown. 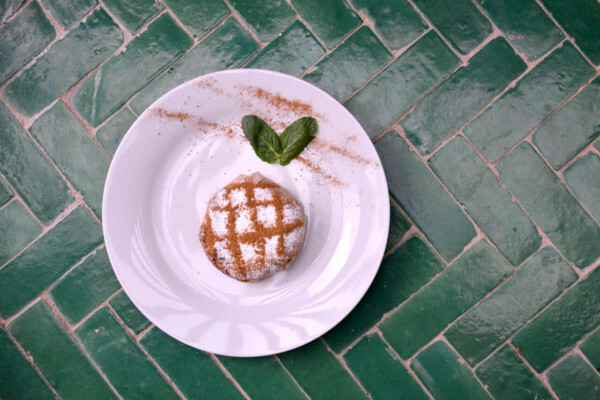 Once your pastilla is cooked, remove from the oven and allow to cool a little before dusting it with the icing sugar and cinnamon.